Life after Scott Brown is something Celtic have been reluctant to countenance despite the midfielder entering his mid-30s. The failure to sign John McGinn in the summer was widely recognised as a missed opportunity to embed the natural heir to Brown, given his robust nature. However, Celtic's impressive recent form without their captain has inadvertently shown that the search for his successor has been flawed, too focused on combative qualities rather than his ability to orchestrate play. An extended run of games without Brown was an uncomfortable but necessary test for Celtic to go through as they plan for the long-term. A Scott Brown absence is scarcer than a pre-match smile - he's never been injured for more than three months since joining in 2007 - which is why the question of his replacement has been a creeping issue rather than a pressing one, but there had always been an air of trepidation whenever a Celtic team-sheet was missing number eight. And that feeling of consternation had certainly mounted just over a month ago as Brown's calf injury coincided with Brendan Rodgers experiencing his first bout of Glasgow's 'goldfish bowl' pressure. Celtic had only scored seven goals in as many games, dropping the same number of points in that time as they did in Rodgers' entire first campaign. Yet, it's proved to be a blessing in disguise, and one which may give Celtic the self-assurance that there will be no cliff edge effect when Brown retires. There had always been a vulnerability to a Celtic team without Brown. A lack of a gallous streak and a shortage of fight were two of the main qualities usually cited. It's right to state that those were factors which led to some of the meek performances, but the tendency to reference intangibles when describing Brown is why the search for a 'like-for-like' replacement is a futile one. Whether his footballing ability is deemed secondary to his physical attributes because he has chosen to stay in Scotland his whole career is debatable. Regardless, he is a far more cerebral player than given credit for. Brown brings a harmony to Celtic's play that his replacements simply haven't, but that's because the default choice has been to substitute in the brawn of a Kouassi Eboue, for example, rather than the composure of a Callum McGregor. That was until October 7, when Rodgers decided to move attacking midfielder McGregor back to Brown's deeper position in Celtic's 6-0 win over St Johnstone. A player of nimble feet and an uncanny awareness of space, the decision to prioritise technical proficiency ahead of physicality has paid dividends. Twenty goals in their last four games and five consecutive league wins for the first time since the end of Rodgers' first season attests to that. The performances of the Scotland international have since shown that Brown has been mischaracterised as simply a snarling, destroyer type of midfielder. Although McGregor is more inclined to play incisive passes through the lines than Brown, McGregor's linking of the play is what Celtic have lacked when Brown has not been available. It's possibly the downside to status as a virtual ever-present that Brown's footballing ability has been underappreciated, but this period will surely serve as a reminder as to what he is as a midfielder. The number one criterion Brown's replacement must possess is a similar footballing intelligence in order to dictate games. That is the primary asset he has brought to Celtic over the last decade. His aggression and full-blooded challenges will make the showreel when he retires but they are subservient to his understated performances on the ball. He had the ninth highest pass completion percentage in the 2016 Champions League group stage with just under 95%, which, while not an indicator of quality or difficulty level, shows how involved he is in Celtic's build up. He brings stability to Celtic's play and that's what McGregor has seamlessly replicated. Whereas McGinn, now at Aston Villa, is reminiscent of Brown in his youthful days at Hibernian before Gordon Strachan refine his game. Unlike McGregor, McGinn is ill-suited to acting as the midfield harness. He is far more comfortable in transition where he can use his power and drive into space as opposed to receiving the ball facing his own goal. Granted, injuries to Kouassi, Youssouf Mulumbu, Olivier Ntcham and long-term absentee Nir Bitton necessitated Rodgers continue with McGregor the last two games against Hearts and Dundee. The reasoning behind its initial trial at McDiarmid Park remains clear though. It came just three days after Rodgers lamented Celtic's struggles in possession against Salzburg, saying "at this level you have to be better with the ball and keep the ball and be able to play quicker with minimal touches, otherwise you don't get a rest in the game and that hurt us". Mulumbu was the deepest midfielder that day with Ntcham supporting, but it is no coincidence that McGregor was soon trialled afterwards as Celtic needed a natural playmaker to fill the void left by Brown. 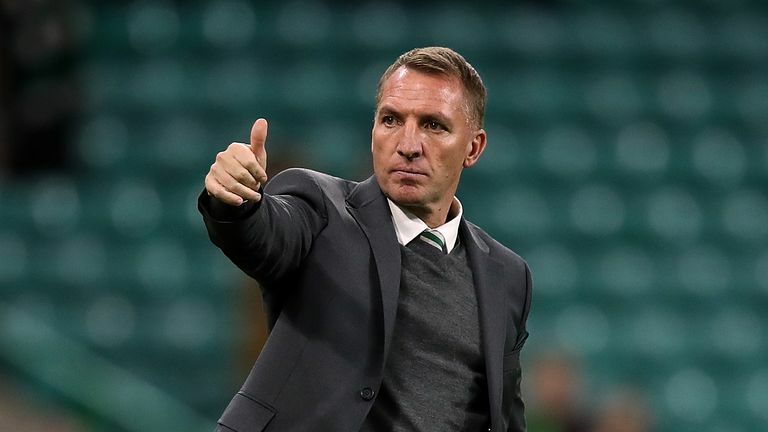 Rodgers interrupted McGregor's spell in Brown's deeper role against Hearts in the League Cup semi-final, opting to go with Kouassi and Ntcham as the midfield pairing. Celtic struggled to break Hearts down as the game became fragmented, until Kouassi was taken off injured and McGregor retook control of his temporary position. It would be incredibly reactionary to suggest Celtic are better without Brown considering how imperious he has been under Rodgers. McGregor has improved Celtic's counter-pressing as he supports the play higher up the park, but it would be foolish not to highlight McGregor's need to recalibrate his position at times to avoid allowing breakaways. Brown provides greater security, but there were fears during the 2015/16 season, the last of Ronny Deila's tenure, that Brown was approaching the twilight of his career after a series of hamstring injuries hampered his form. At that point, there would have been an insecurity about Celtic's midfield continuity. After the success of the last six weeks, it may just have made Brown's inevitable departure that less galling a prospect now the exact parameters of a Scott Brown void are fully understood.